A brand new line of premiere African American Woven Tote Bags featuring genuine artwork from Black artists that will uplift and inspire your soul. These wearable art designs feature genuine artwork by real Black artists. Made with jacquard woven cotton, polyester tapestry fabric and fully lined. Includes zipper closure, three inside pockets (one of which is zippered), plus a sturdy woven over the shoulder strap. Stand out from the crowd with the new African American Tote Bag Collection by Shades of Color, designed to meet your every day needs. 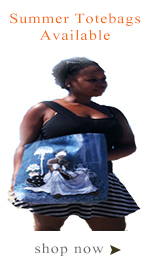 This bag features "Angelic Guidance" by Buena Johnson.